You’ve sold some products and now you’re ready to collect your profit! Great job! Sellers can request payouts from within their Teespring account. We take your payouts very seriously and have a complex system of checks and balances that happen before we hit “approve” on payout requests. Don’t forget you can fast-track payouts by optimizing your account—continue reading to learn how. Payouts requests are processed within 1 to 7 working days. First-time payout requests usually take 7 working days to process (for security reasons). Sellers can request a payout within 24 – 48 hours of a listing’s print cycle ending. Pending payouts worth less than $100 can be requested every 3 days. It’s best to group your payouts and request more funds at one time. Make sure your PayPal account is completely set up and verified before you begin requesting payouts from Teespring. If you notice a delay in PayPal payout from Teespring please check your PayPal account for messaging regarding a “Receiving Limit“. You might need to provide additional account information to PayPal once you hit a certain payout amount. Please note the receiving limit can be different within different countries. Sellers should contact PayPal for more information regarding their limit. Payoneer: once processed payouts should be received within 24 – 48 hours. Paypal: once processed payouts should be received within 24 – 48 hours. Once requested, if you do not receive an email from Teespring confirming your payout has been processed after 7 business days please reach out to campaigns@teespring.com. 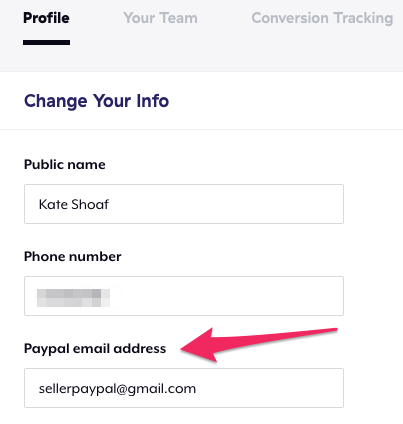 You can also contact seller support if you need to cancel a payout (ex: “Oops! Made a typo in my Paypal email”). There are a few ways you can improve the likelihood of having your payouts processed within 24 – 48 business hours. Consistently earn pricing discounts: sellers who earn pricing discounts every month due to consistent product sales get pushed to the front of the payouts line (regardless of sales history—so smaller sellers benefit from this too). Build up your sales history: seller accounts with an established sales history or numerous processed payouts for a particular payout method (i.e. PayPal or Payoneer) are also greenlighted for faster processing. Two-factor authentication: this helps us ensure your account is legitimate and fast-track you for payout approval (learn more). 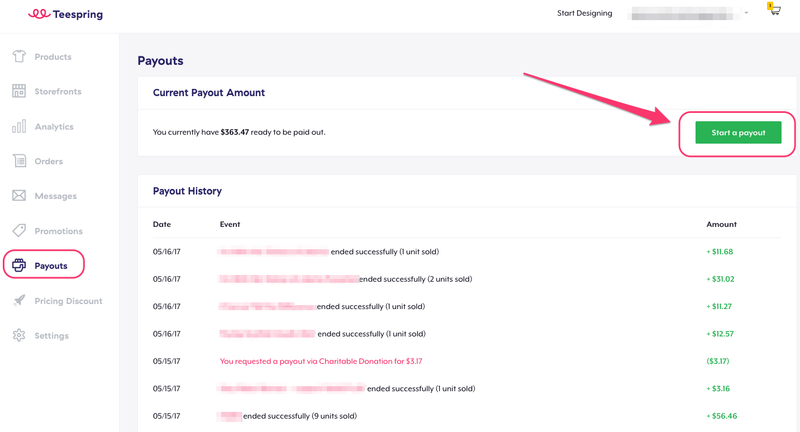 Limit pending requests: Requesting a payout for every sale slows down our system––it’s good practice to wait until you have racked up over $100 or more before you request a payout. NOTE: Keep in mind you will need to verify your payout method (within your account settings) before you can request a payout.